US, 1986, 85 minutes, Colour. David Carradine, Lee Van Cleef, Mako. 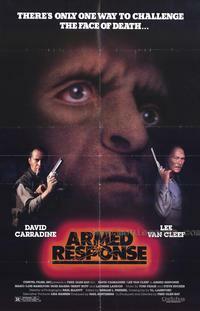 Armed Response is one of those action thrillers that proliferated during the '80s - often going straight to video distribution. David Carradine appeared in many of them. Here he is teamed with veteran Lee Van Cleef as his father confronting Mako as a Japanese businessman in Los Angeles. There are double deals, ruthless fight-outs, torture - given a bit more strength than usual by the credibility of the acting. It is a bit better than some of the usual material churned out for broad viewing. 1. Entertaining action thriller? Violent thriller? 2. Los Angeles, Chinatown, the bar, homes? Special effects and stunt work? Score? 3. The title, indications of violence? The background of Vietnam experience, weaponry? Brought to bear against criminals? 5. Jim, working in the bar, love for his wife and daughter? The customers in the bar and their talk? Clay and Tom and their relationship with their father? The father at the bar? Memories of Vietnam? Ousting troublesome customers? The cache of arms? The taking of Tom and his death, under torture, memories of torture in Vietnam? Jim and his memories, taking command, with his father? Confronting Tanaka? Turning the tables? The final shoot-out? The confrontation and his wife shooting? 6. Clay and Cory, their deals, the exchange of the money for the statue? Meeting the criminals, the shoot-out, the girl surviving? Cory killing Clay and betraying him? Escaping with the money? Clay's death? Jim's pursuit of Cory and tricking him into admitting guilt? The girl pursuing Cory - and his death in the harbour? 7. Popular ingredients for action thrillers? The taken for granted stances of violence to resolve situations? The mentality of criminals? Background of police and Vietnam war? Crime in America?